There is a ton of competition for brands that want to help women make their body and skin look and feel their best. 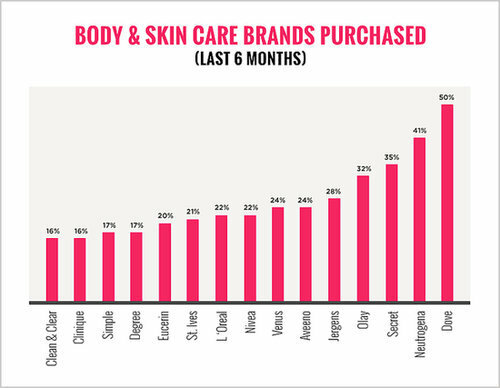 As part of the POPSUGAR Insights Q2 2014 beauty study, we asked women to tell us which body and skin care brands within the category they have heard of and which brands they've purchased in the last six months. Here are the results. There were five brands in the category that enjoyed awareness levels over 90%. Dove ranked No. 1 overall with 95% awareness, followed by Neutrogena (93%), Olay (93%), St. Ives (90%), and Nivea (90%). 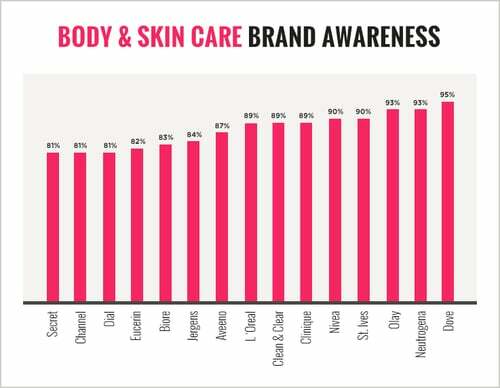 Three brands very nearly cracked the 90% awareness level, including Clinique (89%), Clean & Clear (89%), and L'Oréal. Overall, 60% of brands within the category enjoy awareness levels exceeding 80%. In terms of past purchased, Dove ranked a clear No. 1. Exactly half of women in our survey have purchased a Dove body and skin care product in the last six months. Neutrogena ranked second overall, with 41% of women having purchased one of its products in the last half-year. Secret (35%) and Olay (32%) ranked third and fourth overall, respectively. St. Ives ranked fourth overall in terms of brand awareness but ranked 10th in terms of past purchases.